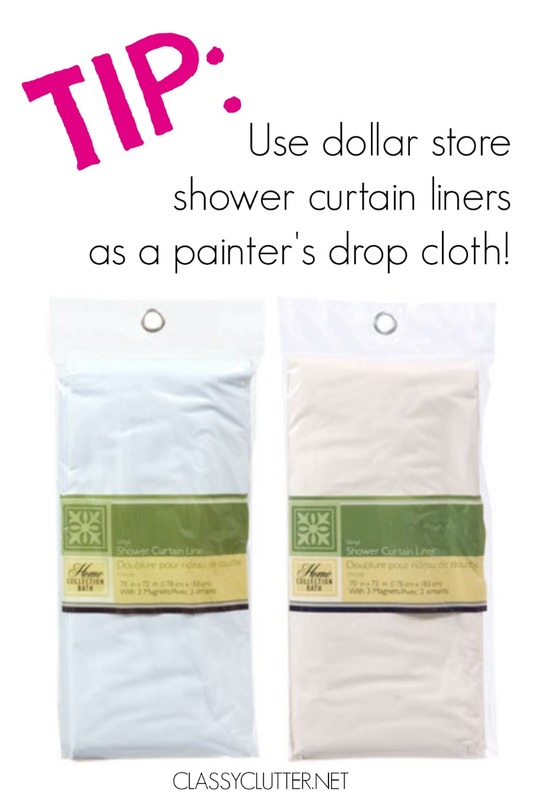 Use a dollar store shower curtain liner as a painter’s drop cloth! Love to spray paint? We do! 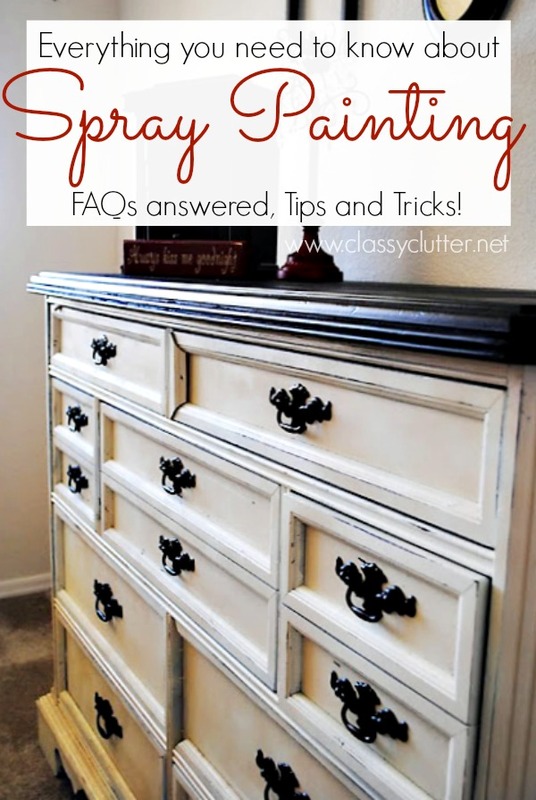 Check out our spray painting FAQs and tips! Be sure to check out our “Painting” Pinterest Board for even more tips, tricks and all things paint related! Ladies, your timing could not be more perfect! 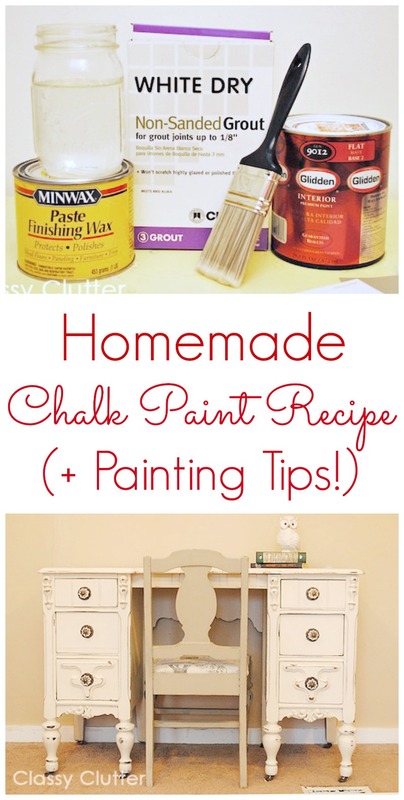 We are getting ready to paint the main living area of our home, and these tips are so helpful! Thanks so much for sharing your wisdom! Have a wonderful weekend! Thanks for the great tips ladies! I’ve pinned to use for future reference. What is the best way to get layers of paint off of plastic l8ght switches and plates? I remove paint from light/receptacle covers by putting them in a zip-lock back of warm soapy water and vinegar. Let them soak for several hours and the paint with rub off. I have an old oak bedroom suit and I want a new look.Thinking staining it with a walnut or mahogany.Maybe painting it white with gold hardware.What do you think? When not painting put rollers and brushes in zip lock bang set in refrigerator. Putting the exact color information of the room on the back of a light switch is a genius idea! I would love to have done this so whenever a hole goes in the wall, I don’t have to repaint the entire room when I fix the hole! That is, unless I get lucky and choose a good enough to blend color. i have copd and can’t be around paint flumes. are there any ways to get around this? Onion in an open bowl of water it seems to work! 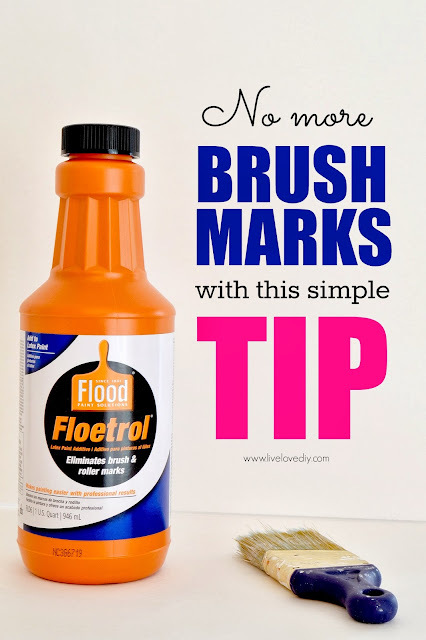 Great tips.. one thing I found instead of shower liners for drop cloth, I got some cheap floor runners, they stick to the carpet and stay down flat without having to tape, you can push them under the trim to get everything protected, when done, just roll up and store for next time. To me it was so much better than a drop cloth that keeps moving, bunching up etc. Thanks for the tips! 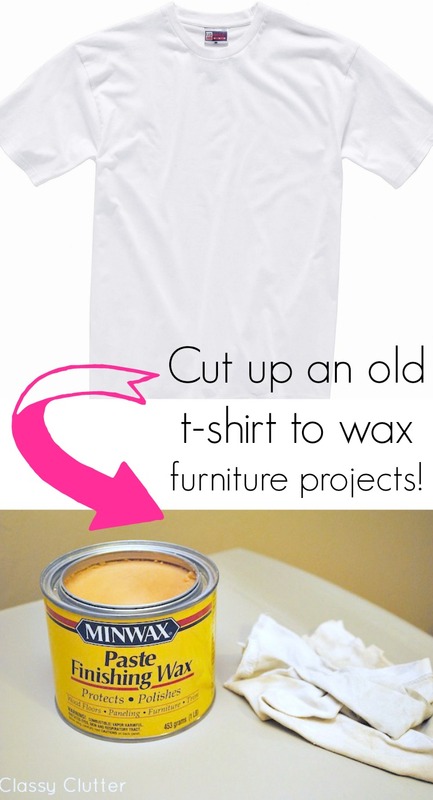 It is amazing how ideas as little as these can make your life so much easier while you paint. 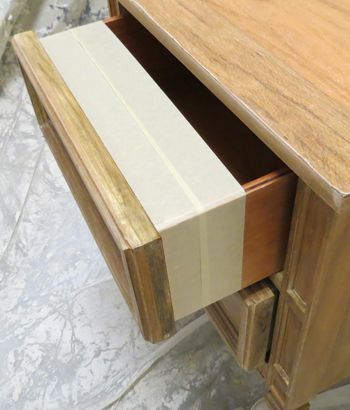 Putting the tape on the inside of drawers is a great idea and can be very helpful! The $Store in my area sells a product called “Awesome” and it is awesome. 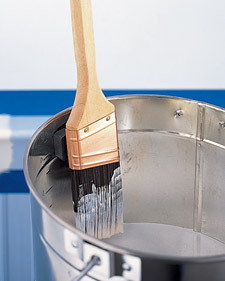 If you pour some in a pail and lay your old hardware in there, within a few hours the paint will fall right off. Just put a crockpot liner in your crockpot before putting handles in there to soak. That way easy cleanup. Good tip, using liner in Crockpot, but I just picked one up at a thrift store or garage sale that is used for hardware only. 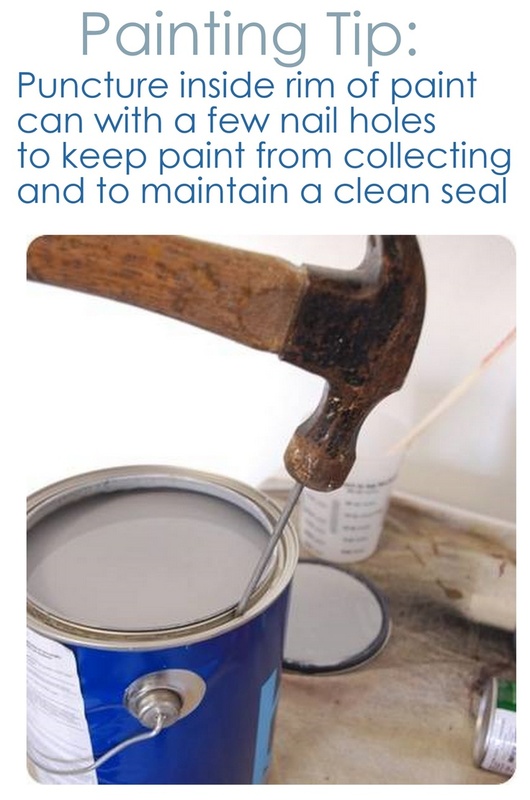 So I read a lot of painting and DIY blogs and I thought I read all the tips. 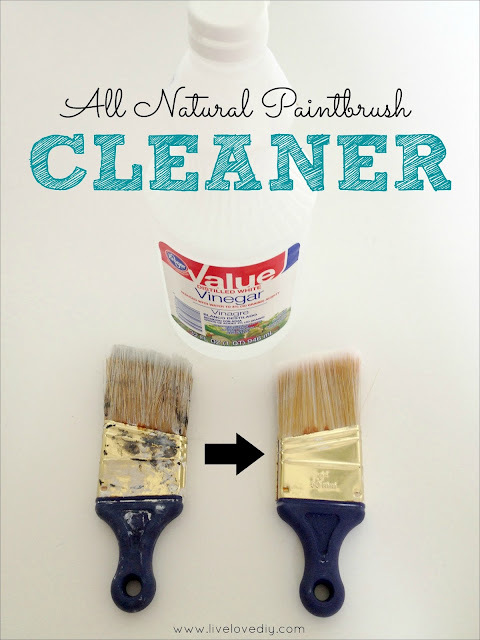 However you are one of the first I’ve read that suggest using vinegar to clean paint brushes. If this works it is truly an economic solution for brush maintenance.